We spent New Year’s week in Scotland. We were based in Falkland, Fife, a small village some thirty miles north of Edinburgh. Although a small village, it wasn’t short of drinking venues! In fact there was one, The Stag Inn, literally ten yards away from the cottage we were staying in, good planning Tara! Unfortunately The Stag Inn didn’t sell any real ales, so I had to wait until the Sunday for my first pint of real ale, even then the first pub we visited wasn’t a real ale pub. But my real ale thirst was quenched that afternoon when me and Thomas called in at The Bruce Inn. 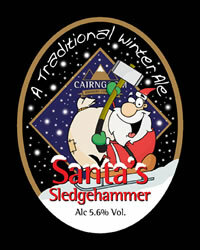 I started with a pint of Santa’s Sledgehammer (5.6%) brewed by The Cairngorm Brewery Company and followed it with a pint of Caledonian 80 (4.1%) from The Caledonian Brewery. On the Monday, New Year’s Eve we travelled into Edinburgh for the Hogmanay festivities and found ourselves in The Whiski Bar and Restaurant on The Royal Mile. Unfortunately we couldn’t stay long as a private party had booked the venue, but I managed the third of my 1001 beers. I had a half of Innis and Gunn‘s oak aged beer (6.6%) and have to say I wasn’t too impressed, but it’s another one off the list. Later that evening me and Thomas called in at The Mitre, another fine establishment on The Royal Mile. It was getting busy and with Devon being under 18, she wasn’t allowed at the bar, so her & Tara beat a hasty retreat to Starbucks. So it was just a quick half of 5 Gold Rings brewed by a not so local brewery, The Vale Brewery, who are based in Brill, Buckinghamshire. Apparently Brill was the inspiration for Bree in Tolkien‘s Lord of the Rings. The following day we drove three hours to Loch Ness, we didn’t find Nessie, but we did find Light Ness, Dark Ness and Spooky Ness, all beers on tap at The Benleva Hotel in Drumnadrochit, the brewpub of Loch Ness Brewery. So a fine end to our week in Scotland, nine different real ales and my third beer of the 1001 beers to taste before I die.